The rewards of hiking in Denali are many: spectacular vistas, encounters with wildlife, and the experience of being alone in wilderness. However, Denali has practically no trails. Most hiking is cross-country. Be prepared for uneven terrain, streams and brush. The different Denali terrains present distinct challenges, as well as distinct fascinations. The taiga forest, found in the lower elevation areas, consists of primarily spruce trees, willow and other brush. This dense cover may impede hiking, but the struggle is often worth it for the vistas possible when you break through to the higher tundra areas. The front country of Denali offers trails through the taiga forest making it easier to travel in this scenic area. The taiga forest is home to many different plants and animals including moose, bear, red squirrels, woodpeckers, and many varieties of berries. 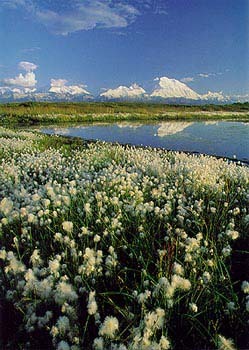 Moist tundra, has a ground cover of sponge-like mosses and small brush. Hiking in this habitat offers a chance to spot caribou, fox and bear among the wildflowers and berries. Dry tundra is found in the higher alpine areas, interspersed with scree (small loose rocks). It is home to spectacular wildflowers. Dall Sheep, Caribou and Arctic Ground Squirrel thrive in this seemingly barren ecosystem. A great way to take a moderate hike with good visibility is to walk along the wide gravel bars of Denali’s braided rivers. It is possible to see impressive animal tracks, many varieties of wildflowers and wildlife as they travel this relatively easy route. Just as Denali has few trails, there are few bridges in the backcountry of Denali. Stream and river crossings can be tricky. You’ll probably want to start off on the small trail system near the park entrance. And the park is planning new trails suitable for day hikes along the the Nenana River corridor (mile 231-238 along the Parks Highway) and in the Savage River area. The Savage River trail system will provide a range of different length hikes. The park is also considering, but has no plans to build, short trails at Primrose (mile 17 along the park road) and in the Wonder Lake area. For the latest news on these trails, check with the park visitor center when you’re there, and don’t be shy about letting us know how you liked them when you return. One approach to day hiking in Denali is to follow the park road. Just hop a shuttle bus and get off anywhere you like. You can hike into the park from there, and when you feel you’ve gone far enough turn back and either wait for next shuttle bus or wander along the road. You set the agenda. Overnight stays in the backcountry of Denali National Park require a free backcountry permit available at the Visitor Center during the summer months and at Headquarters during the winter months. Permits are issued only one day in advance; reservations are not accepted. Here’s how the permit system work. Denali’s backcountry is divided into 43 units; only a limited number of backpackers are allowed each night into most units. During peak season, many units may be full for several days, and other units may be closed due to wildlife activity. Before you leave home, pick up a copy of the Denali Backcountry Companion, and have in mind a few areas that you might want to explore. Or you can do research on the spot at the Backcountry Desk, which has a collection of Backcountry Description Guides. A Quota Board on the wall behind the Backcountry Desk will tell you what units are available. Most areas require the use of Bear Resistant Food Containers (BRFCs), distributed free of charge with your backcountry permit. Or buy your own and you’ll always have them handy. You do not need a special permit to dayhike, but you do need to avoid areas closed to entry. Ask for a current closure map.